A good painting is like a best friend to me. It gives me comfort, energy, happiness and keeps me company. I find myself constantly painting in my mind, even if there isn’t a painting knife in my hand. 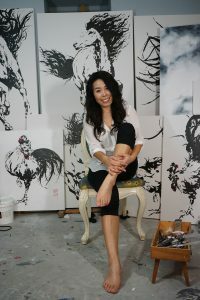 I was born in South Korea and took inspiration from both Canadian and Korean cultures. I utilize the concept of “The Beauty of White Space”. In traditional Korean art, white space acts as a blank canvas to the people, allowing them opportunities for imagination, while the simplicity of the background draws attention to the highlight of the piece. My art aims to combine the simple background and strong expression to display luxury in simplicity, passion hidden in calmness and beauty within sorrow.